Italeri reissued the old Esci kit which had been considered "lost" for years and was previewed here. The only thing which is really new are the decals. 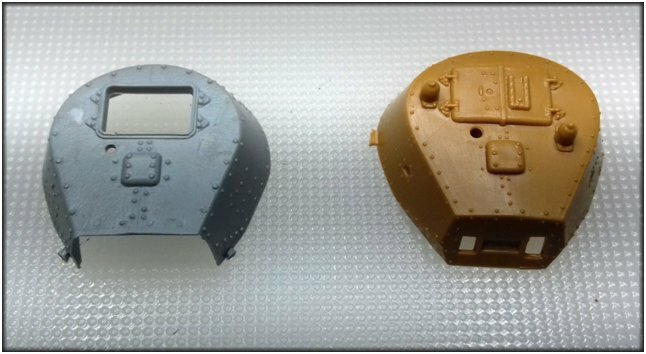 Having concluded, in the previous articles (which you can read here and here), that this kit represents an M14/41, building a correct M13/40 of any serie is possible with some work, and we pointed out already where to concentrate the efforts when building each serie of the tank. This article will guide you to build the kit as OOB as possible, to obtain an early M14/41. Unfortunately, the kit has issues which must be addressed anyway. Issue n. 1: the tracks. Italeri could have given us new, link and length tracks when re-issuing the old Esci kit, which had the typical vinyl tracks of early Esci productions, yet nothing, the tracks are more or less the same. This means that you have to rely on aftermarket tracks: OKB Grigorov makes excellent resin tracks, but GB Modelli tracks are very nice too. Issue n. 2: the turret. The shape is totally wrong. The front "window" is too wide (more than 4 mm in 1:72 !) and the roof is entirely flat, while it should be raised in the center and gently sloping toward the outside. The following picture shows the difference between the one in the present kit (left) and the one in the new fast-build kit (right), which, as you can read here, happens to be just right. Even the gun shield in the fast-build kit is more correct than the one in this one. The back plate (piece 3A) must not be aligned to the lower profile of the hull as the instructions seem to show, but to the highest, or the track tension regulator sustaining the idler wheel (16A/17A) will not be horizontal as it should be, but oblique. 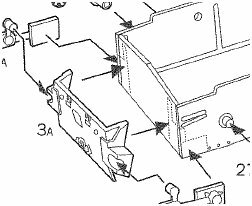 The best approach would be to mount pieces 16A/17A on the hull being sure that they are horizontal, then mount piece 3A. When mounting idler wheels (28A/29A) verify that the spokes of the outer half coincide with those of the inner half. When separating each wheels/suspensions set, pay extreme care not to cut out part of the wheels: it is very easy to damage the rubber part. Eliminate the mud clearing blades from pieces 9A/10A. Verify that the fenders are correctly aligned, as they will serve as supports for the crew compartment, which can not be mounted correctly if the fenders are not perfectly perpendicular to the lateral sides of the hull. The crew compartment itself is composed by five parts (14-18B) which do not line up really well. Better start from the rear (14B) using the engine deck as a guide for correct placement (the lower pegs are incorrect and should be removed), then the front (17B), glued to the front plate and finally the lateral (15-16B) and upper (18B) parts. Eventually, pieces of sprue can be glued internally where the plates form the right angle, to be sure that the angle is exactly right and to reinforce the whole structure. The angles around the twin Breda hull blister are too sharp and should be smoothed with sandpaper and liquid glue. 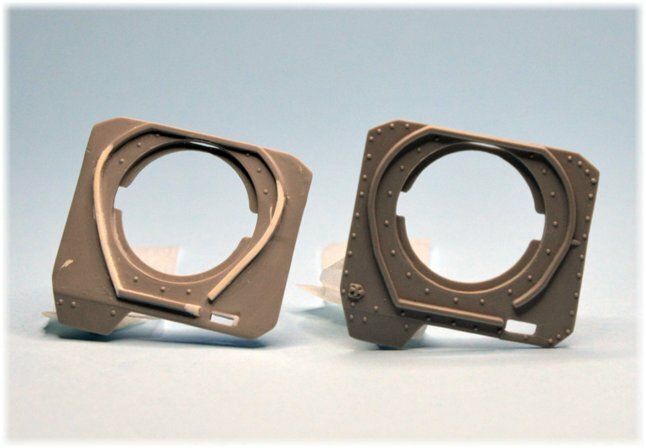 Since it is highly suggested to use the turret from kit 7517, the whole turret ring on piece 18B should be rebuilt to house the new turret, using a 0.5mm-thick square plastic rod. In the picture, the modified piece is on the left, the original one on the right. While doing this, try to save as much detail as possible, for example the antenna mount. Finally, substitute the left spare wheel with the jack (19A) and modify the posterior radiator cover, to make the later "mushroom-shaped" one, with lateral "wings" and a posteriorly relocated cap. 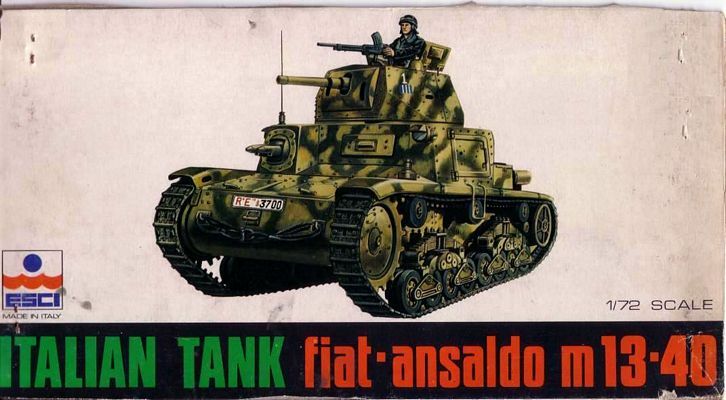 The kit gives the opportunity to build a command tank for batteries of Semovente da 75/18: those vehicles were produced on the chassis of M13/40, M14/41 and M15/42, starting from M13/40 3rd serie. The kit contains a circular plate to be mounted on the turret ring instead of the turret itself, but the piece is greyed out on Italeri instructions, meaning that it is not to be used. However, it could be a good starting point, provided that the 4-pieces-hatch is built from scratch, along with the two antennas. 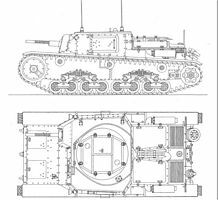 On the first batch of command vehicles (those on the M13/40 chassis) the original twin Breda 38 MG were maintained, while on the vehicles on the M14/41 chassis they were substituted with a single Breda 31 heavy machine gun. So, to build an accurate command tank, apart from scratching the hatch, either the tank is backdated to an M13/40 3rd serie, or the Breda 31 is scratchbuilt. ModellTrans produced quite an accurate conversion set (MT72301) which is now OOP. In the following paragraph we have tried to summerize all the necessary steps to make a real "perfetct" model from a kit which, as discussed, has many flaws. The tables which Antonio Tallillo drawn for On The Way will help a lot: follow the numbers in the drawings to read the explanation below. Cut off and reshape the moulded area for the mud clearing blades and leave a circular riveted piece only; eventually, add the missing rivets. The rear track tension adjuster must be detailed by repositioning upper and lower rivets and adding more in the rear. For a 2nd-3rd serie M13/40, a little surgery is required to have get the correct shape of mudguards, which must be shortened. First reduce the thickness from the bottom, then trim with a sharp knife the mudguards until the appropriate length is obtained. Cut off some more plastic than needed and sand the rear edge gently to make sure you have a good result. Other detail to add on the mudguards are the inspection windows: drill the holes after double-checking the references. The last touch are the brackets, built from paper strips and plastic sheets with bolts added. The twin Breda hull blister was a cast part, later bolted to the superstructure front. The piece is too smooth, so cover it with liquid glue, then tip the plastic very gently with a flat old brush, so the area softens enough and a more rough texture emerges on the surface. Drill four small semi-holes on the top – toward the superstructure – for rivets heads and make the two inner rows of bolts. At the base of each Breda MG, it is easy to add the flat, irregular thickness of melted iron which was never taken out and remained noticeable. The piece lacks the side bullet splash stripes too and it is necessary to relocate and add some bolts to upper and lower panels. Working on the Breda MGs, the armored sleeves look correct if we add the bolted locks between them and the telescopic sight tube; do not forget the disk cap for the machine gun barrels and the hole for the sight. On the superstructure top, make the inner edge of the bullet splash ring with of paper stripes, then make bolts on inner side, including five on the fore bar, replacing bolts of outside edge with rivets. 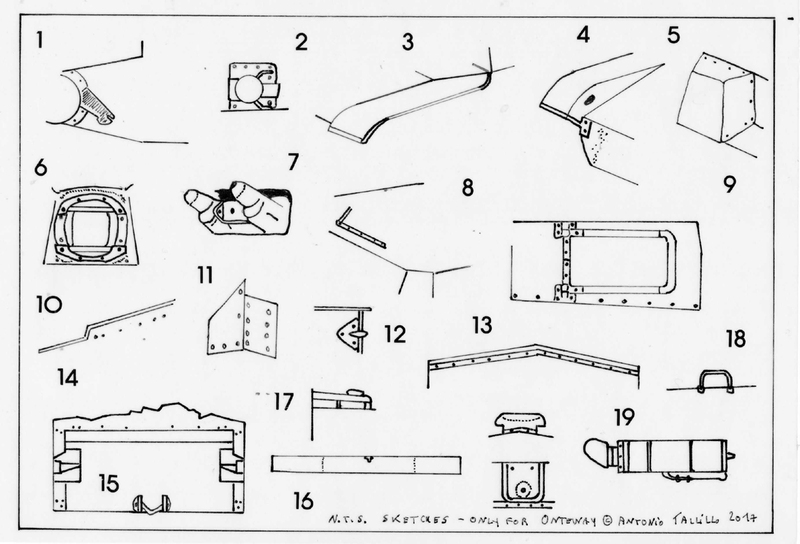 For a 2nd-3rd serie M13/40, remove from the side walls of the superstructure the small stripe which should support the long mudguards, not needed as the mudguards have been shortened, keeping the hinge of the crew hatch and matching the upper row of bolts. The crew hatch has a five separated panels edge, with bolts in the fore section and rivets in others. Enhance the relief of the piece with a blade and replace the handle with a new one from fine bent copper wire. Moving to the hull rear, apply a row of bolts to the rear sides of the hull (upper and lower). Add the 'L' shaped reinforcements plates with their bolts at the corner. Add the bolts on rear tow hooks plates. Add the bolted reinforcement strip between the vertical rear plate and the engine deck. Add a row of bolts to the rear plate at the bottom and over the upper edge of the stowage box. The towing pintle is incorrect for an M13: build a new one from stretched sprue. Enhance the relief of the central hatch in the stowage box and add a 'T' shape handle. From the 3rd serie M13/40 onwards, the posterior radiator cover acquired the typical "mushroom" shape in section, which means that the original piece must be modified. Also, slice off the moulded-on filler cap, which must be thinned and glued slightly toward the rear. The rear strip lacks four bolts very close to each other. Replace the handle over the superstructure top with a new one from fine bent copper wire. 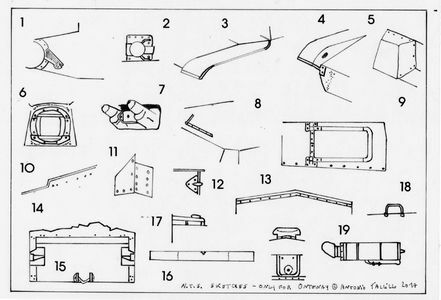 The mufflers had four low reliefs, so after have sanded off all kit's piece reliefs cut off the bottom spring, to glue new ones from paper strips, make the brackets from thin sheet with their bolts from white glue drops – and enlarge the sprouts with a fine blade to improve their realism. The aerial base must be raised and the base detailed with three holes for bolts. Use plasticard stripes for the 'y' shaped antenna rest : aerial was high 180 cm, 2.5 cm in 1/72 scale. 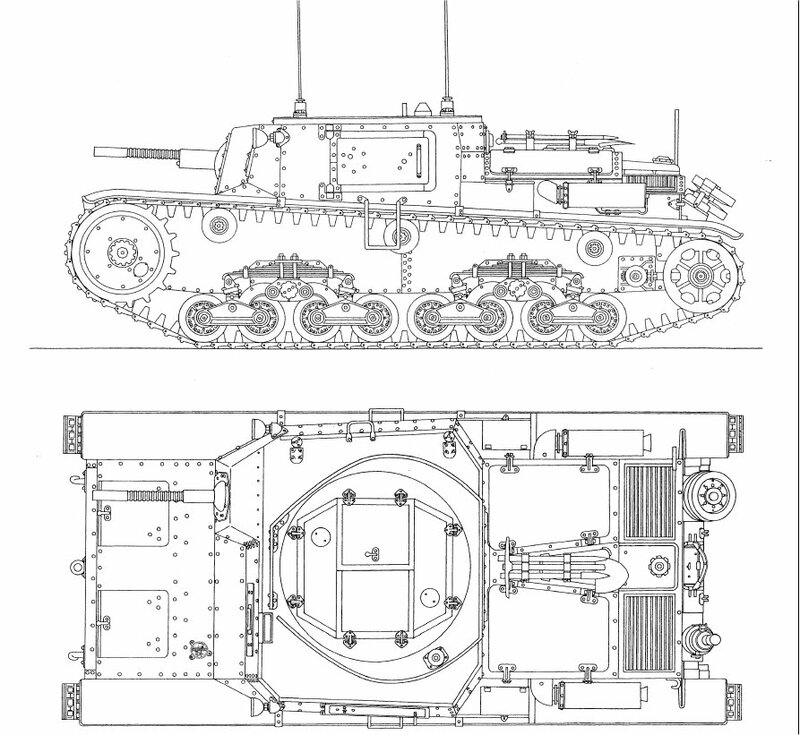 The gun mount was retained in the shield by four large bolts, so four channels for bolts are needed. Drill the channels carefully with a pin vice and glue the bolts. 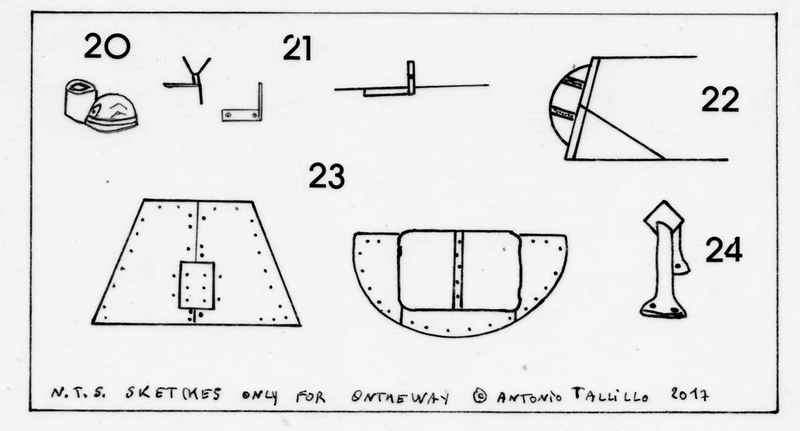 On turret roof only rivets were present, so slice off all bolts and sand them until you see only rivets heads: please follow the layout in the sketch. The AA MG mount is inaccurate and a new one should be scratchbuilt. Replace the original part with a new cylindrical plastic rod, with holes in the sides to accept the new legs from plastic rod bent over a flame candle. Check some photos to set the whole piece with the right angle. It is better to glue the anti-aircraft system later, when all other parts have dried out, because handling may knock off some of the pieces. The turret deserves a separate discussion, besides what we have discussed in points 22-24 in the previous paragraph. As explained previously, the one from the kit is badly misshaped and must be substituted either from the one from the 7517 kit or from one from the First Air resin kit. However, the 7517 one (without doubt the easiest and cheapest to find) has closed hatches and the periscope shape in not entirely correct, so these pieces could be well substituted with those from the 7036 kit. 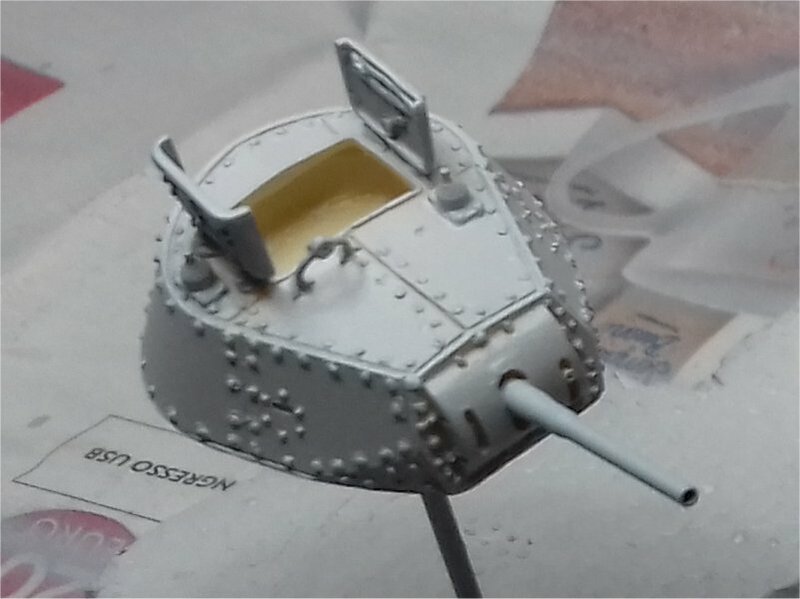 Moreover, the lateral sides are mostly void of details such as rivets and pistol ports, which should be added. The gun shields in 7517, although accurate, should be mounted higher than as per the instructions, with the internally visible part of the shield scratchbuilt because it is missing. 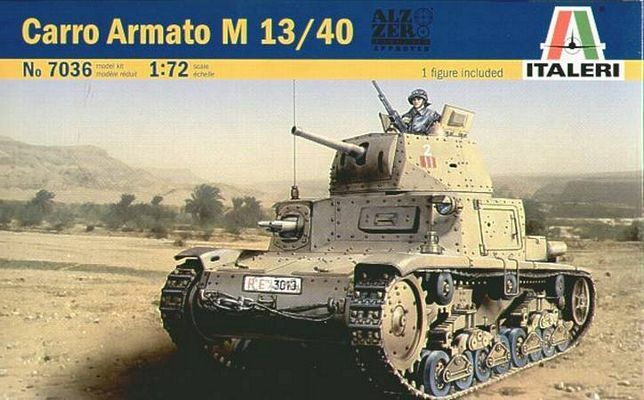 Italeri has remained the only producer of M tanks in 1/72 scale on the market, so their kits are the only possible basis on which to start the building of an M13/40 and M14/41. The 7036 kit, despite being more than 40 years old, is still acceptable and can be built into very accurate representations of the real vehicles, provided that the modeller is willing to put some work on it.